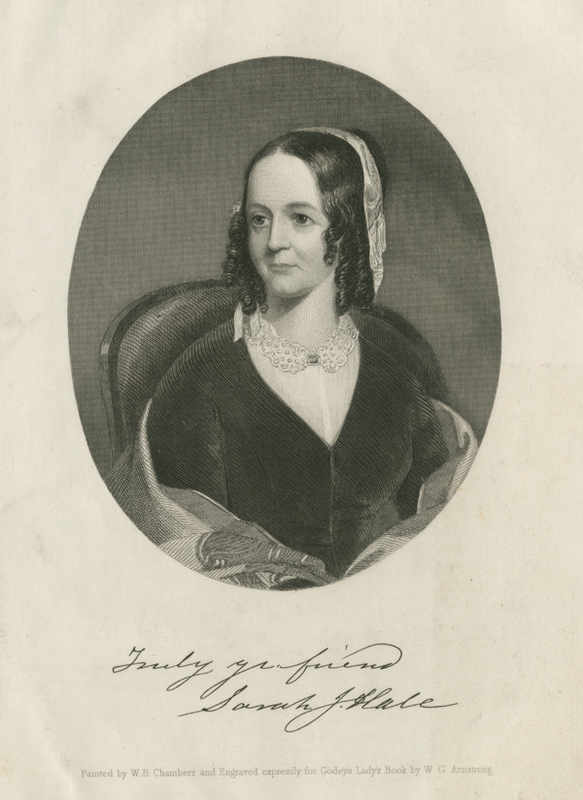 “Sarah Josepha Hale,” in Godey’s Lady’s Book 41 (1850): 326, frontispiece. When her husband died suddenly in 1822, Sarah Hale found herself and her five children in dire need of a steady income. Friends backed the anonymous publication of a collection of her poetry, The Genius of Oblivion (1823). She also began to submit stories and poems to literary magazines and quickly gained the attention and respect of editors of the leading periodicals. 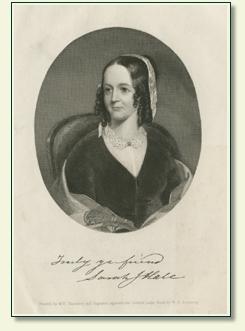 Asked by a Boston publishing firm to edit the first American magazine written for women, Sarah Hale accepted the position and moved her family from New Hampshire to Boston in 1828. She applied scrupulous editorial standards to the Ladies' Magazine: she accepted only original material, solicited work from female contributors, and printed articles that she thought would "improve" her readers. In 1837, at the invitation of Louis Godey, she became the editor of Godey's Lady's Book after Godey purchased the Ladies’ Magazine. She moved to Philadelphia and made Godey’s the leading American women’s literary and fashion periodical for the following four decades. Although she opposed women's suffrage and eschewed controversy in Godey's (she maintained that political involvement would corrupt women's pristine moral sensibility), she consistently advocated education, exercise, property rights, and sensible fashion for women. In addition to her work on Godey’s, she authored or edited many volumes. In 1853, she issued Woman’s Record; or, Sketches of All Distinguished Women, from “The Beginning” till A.D. 1850, which included abridged selections from the writers’ works as well as short biographical sketches. She issued two subsequent editions of the text and in them featured many of the authors whose careers Hale had helped launch. Thomas B. Read, ed. Female Poets of America (1849), plate opposite p. 181. The Lady’s Writing Book (between 1849 and 1855? ), vignette portrait on wrapper. Sarah J. Hale, ed. Woman’s Record (1853); also 1855 ed. Abner D. Jones, ed. The Illustrated American Biography, vol. 2 (1854), p. 291. Abner D. Jones. The American Portrait Gallery (New York, 1855), p. . The Ladies’ Repository (April, 1855), plate preceding p. 193. Henry Coppée, ed. A Gallery of Distinguished English and American Female Poets (1860), p. 297.